Ghost The Magical. There's a new magic star in town set to rival the cinematic wizardry of Harry Potter, but this one's live on stage every night. Ghost The Musical, the stage adaptation of the award-winning movie Ghost, masterfully fuses song, dance, theatre and magic to create a stunning live show. Despite being crammed full of special effects, video walls and ever changing sets, the pace of which is often frantic (frantic in a good way), Ghost the Musical's strong cast work with the hardware, not against it. Hollywood constantly struggles with this, often delivering incredible special-effect driven blockbuster movies that really have little soul. But Ghost The Musical is full of heart and soul, and it manages to seamlessly embrace the full force of the production's incredible effects. Paul Kieve is the man behind the magic and his contribution to this technically demanding production is nothing short of staggering. 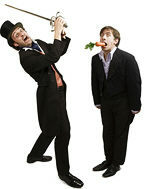 The 'magic' for want of a better word, draws audible gasps and spontaneous applause from the audience throughout. In fact this is the most powerful use of stage magic that I have ever seen. By the end of the show I was left sad (storyline!) but elated. In April 2012 the production will open on Broadway. 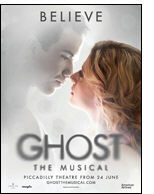 In London Ghost the Musical is currently booking until 13th October 2012 at the Piccadilly Theatre, Denman Street, London W1D 7DY, Monday to Saturday at 7.30pm, with Thursday and Saturday matinees at 2.30pm. Box Office 0844 871 7618, Ticket prices around £25 - £70 via www.ghostthemusical.com. John Calvert - London Palladium debut. From Paul Stone: It is now looking more and more likely that John Calvert will be making his long awaited London Palladium debut in the 'Palladium Magic' Charity Show on Monday 19th September. John will be joining a stellar cast including Hans Klok, Mac King, Jeff Hobson, Silvan, Marko Karvo, Michael Finney, Mikael Szanyiel, Paul Zenon, Erix Logan, Nathalie Enterline and legendary juggler Kris Kremo. So, if you want to see a world class Magic Show at this very special Variety Theatre and want to be there to experience Magic History in the making, book your tickets now at www.palladiummagic.com. 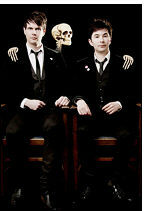 This could very well be the last big Magic Show ever staged at the London Palladium. If you live in the UK and want the chance to win the Royal Box for 'Palladium Magic' for you and three friends, and also win tickets to see Derren Brown's touring show in 2012, and meet him after the show, you should enter the 'Palladium Magic' competition. It costs just £1.50 to enter and you can enter as many times as you like. All the proceeds go towards our MagiCares Charity ticket initiative, donating 1,000 tickets to local London Cancer related Charities, Children's Hospices and other deserving Charities for their patients, families, carers and nurses to enjoy a magical night out at the Palladium. 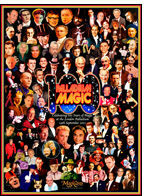 Check out the 'Palladium Magic' website, www.palladiummagicshow.com for details. But hurry ... the competition closes on 11th September!